Wilmington College President Jim Reynolds with Debra and Timothy Trayer. WILMINGTON — Debra Brock Trayer said it’s literally “a miracle” that she was present at Wilmington College to be honored, with her husband, Timothy, as Philanthropists-of-the-Year when, nearly 50 years ago, her prospects for even attending college were remote. “I don’t know where I’d be now — a shy, insecure farm girl — without Wilmington College,” she said at WC’s annual Philanthropic Leaders Recognition Dinner Oct. 19. The College honored Dr. Timothy and Debra Trayer of Palmyra, Pa., for their philanthropic generosity at the event. She detailed a challenging childhood in which a tornado claimed her father’s life at her family’s farm near Martinsville when she was nine years old. Her mother insisted that she go to college and pursue her dream of teaching first grade. In spite of her less-than-stellar high school grades, WC offered her a chance to prove herself academically in a special summer program. “The first thing Wilmington College gave me was hope — I felt valued,” the 1973 graduate said. “Then it gave me a chance to succeed — WC made me persistent and determined to accomplish my goals. It opened my eyes to a new world and it helped me heal my heart. “Wilmington College also brought me happiness,” she added in alluding to meeting her future husband at WC. Indeed, Timothy enrolled at the College two years after Debra’s arrival. A chance volleyball game on the campus mall led to their meeting. The couple married while he was still a student. Debra landed her teaching job and supported him throughout his time in veterinary school and as he established a successful swine and dairy medical practice in Pennsylvania. 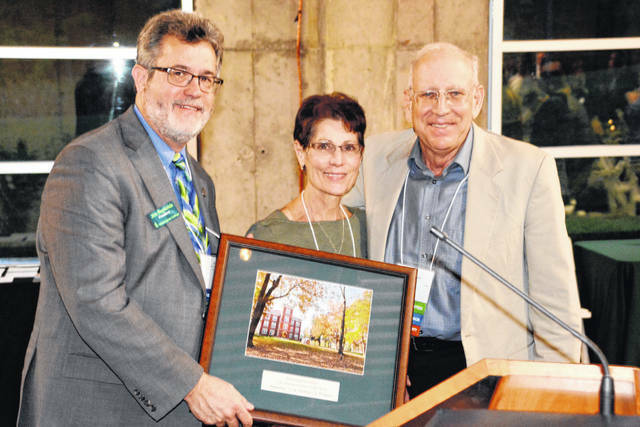 He lauded Wilmington College and the “agriculture roots” they both possess as “foundational” to the couple’s fulfilling relationship and successful lives. The Trayers’ lifetime giving amount places them among in the most exclusive of donor groups at more than $1 million. Their most recent gifts have included providing seed funding for employing a dedicated agriculture student recruiter and associated support for what is now the school’s largest major. President Jim Reynolds praised the Trayers for their longtime dedication to their alma mater and gifts that led to a doubling in size of WC’s entering class of agriculture students over the past 10 years. “Tim and Deb’s generosity has had a transformational impact on our students and College,” he said. Indeed, Reynolds lauded all those friends and alumni of the College whose gifts of time, talent and treasure provide both “opportunities and inspiration.” Invited guests included donors whose gifts, during the 2017-18 academic year, were $1,000 and up, as well as members of the Sam Marble Society, a group whose members have endowed funds or included the College in their estate plans.